Everyone knows that what we see in Hollywood isn’t always the truth. In most cases, movie directors and producers will thoroughly study an area before filming it. But, there are still times when the movies don’t have it quite right. In particular, there are a number of films that depict using an AED, and it isn’t completely accurate. 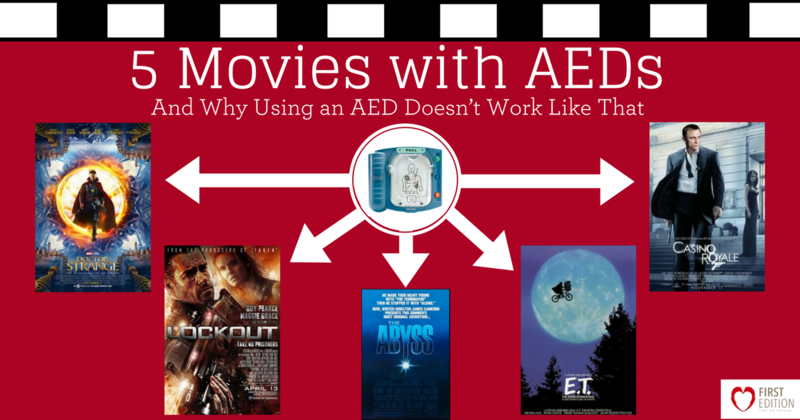 Here are 5 movies with AEDs, and why using an AED doesn’t work like that. After James Bond has shared drinks with some unfriendly men, it becomes apparent that he has been poisoned. He rushes back to his car, informing his team that he is about to go into cardiac arrest. His team then instructs him to pull out the AED from his car and apply the pads to his chest – as using an AED is the only way to save him. But because the AED only has one charge, they need to time it perfectly. Then as Bond slowly fades, he tries pressing the button but no shock is administered. He realizes that the wire has fallen out of the AED pad – but it is too late and he crashes. Thankfully, a woman comes to the rescue, reattaches the wire to the AED pad, and administers the shock. Bond jumps to a start and regains consciousness. Every AED is easy to use and each step is clearly laid out and explained through images and voice activated instructions. This very strange looking AED of Bond’s has a small hidden compartment that holds the AED pads. In addition, the AED only has a single button on the whole device that is used to administer a single shock (not clearly identified). If it were not for Bond’s fellow agents, how would he have known what to do? This AED is clearly not easy to use! The main reason this scene is not plausible is because of the AED pads. These pads are only connected to the AED through flimsy wires. The wires are obviously not properly secured to the AED or pads. In the short time that Bond works to apply the pads, somehow the wires become detached – a life-threatening problem! The AEDs used today do not have wires that can fall off of the pad, as they are securely fastened to the pad. In reality, a person suffering cardiac arrest may need a number of shocks before coming to consciousness. In this scene, Bond receives one shock that requires a long charge time, but wakes him up instantly. The reason why using an AED doesn’t work like that, is because an AED should not take so long to charge up, and should be capable of multiple charges with one battery (during one emergency situation)! In most instances, if an AED took that long, the person would most likely be lost before they could get the assistance they need. Secondly, bond would not be able to push the button himself as the AED would normally scan for a heard in fibrillation (which his would not have been yet) and would therefore not shock – as a safety for those with healthy hearts). In this scene, E.T. has been recently found in the forest, dying, and is brought to the home of Elliot. Scientists have invaded the home cutting of E.T.’s link with Elliot. Now that the link has been severed, Elliot begins to recover while E.T. continues steadily towards death. Tons of scientists and doctors crowd around E.T., working to revive him and save his life. Eventually one doctor suggests the use of the defibrillator. The doctors pull out a medical AED and administer a loud shock to E.T. They continue to perform CPR but it is to no avail. The doctors call it, announcing the time of death, leaving a heartbroken Elliot. Spoilers: E.T. is not dead! In the movie, it is only after much discussion and attempted CPR that the doctors decide to finally administer a shock. In real life, if someone goes into cardiac arrest, the sooner you can attach an AED to them, the more likely they are going to survive. These doctors spent too much time discussing methods of treatment and instead should have brought over the AED immediately. In this scene, when the shock is administered to E.T., the doctors stand back and watch his body jump into the air and a loud sound is heard. Today’s AEDs will not have a sound like this, nor will it be so strong as to jump a body off the ground. Often, the only sound heard is a small zap. What is worse, is that even though E.T. does not respond to the first loud shock, they do not give further shocks. When using an AED, it is common for the machine to analyze and suggest multiple shock administrations when needed. These shocks are meant to regulate the heart back into rhythm, not simply a last-resort option. Something bad has happened to Stephen Strange and he has been wounded by an un-worldly weapon. He has transported himself to the hospital where he becomes unconscious. It is only through his ‘astral projection’ (out-of-body experiences) that he is able to speak with Dr. Palmer to help her properly fix him. Unfortunately, there are villains out to get Stephen and they come to the hospital and battle him in the astral realm. When Stephen’s heart stops, Dr. Palmer brings out an AED and administers a shock. She gets his heart beating once more, but Stephen comes through the astral realm and tells Dr. Palmer to “hit him again.” Using an AED shock, he is able to defeat his foe in the astral realm. Then Stephen returns to his body and awakes. As in most movies it shows a flatline. However, defibrillators are meant to ‘reset’ a heart during fibrillation, not once completely flat-lined. Even if his heart was only in fibrillation, once Dr. Palmer got his heart beating again, another extra shock is not advised! This could cause further damage to the individual or even stop the heart again. Bud and Lindsey are trapped underneath their boat and the water is slowly rising. There is only one scuba-diving suit and two of them. Lindsey then comes up with the idea of allowing herself to drown in the freezing water, while Bud wears the suit and brings her back to the station. There, she identifies, they can resuscitate her back to life. Bud agrees after much protest, and soon enough Lindsey has drowned and Bud swims her back to the station. He notifies the team ahead through radio that they will need to resuscitate Lindsey, so they bring out the AED. A few shocks are administered to no avail, and one of the team members announces that she has flat-lined. Bud refuses to quit and begins to perform CPR, giving a breath after every 5 compressions. After they announce there is no pulse, Bud then begins to violently compress Lindsey, yelling at her to fight. Suddenly, Lindsey coughs and comes back to life. Although Lindsey thinks that it will be no problem to resuscitate her, suggesting that the ice water will help freeze her blood – this is not true. Lindsey has still technically “drowned” and her brain has been deprived of oxygen for far too long. Bud tries to swim as fast as he can to get her to the station, but the fact is that the film makes it appear that it took a long time to get back. Every minute without oxygen is one step closer to death. In the scene where they bring out the AED, the first individual is unsure how to use it. They first put the pads on top of her clothes, someone corrects the placement, putting them on her skin instead. The problem with this scene is not the pad placement, but the fact that Bud and Lindsey were just pulled out of the water and should be drenched. Not to mention, they are giving the shocks on the water’s edge. This could be very dangerous if too much water was in contact with the machine. It is always necessary that you dry off the individual as much as possible before administering shocks! In the scene, Bud is giving a breath for every 5 compressions – this is not correct. The proper way to conduct CPR is to give 2 breaths for every 30 compressions. Though we are impressed that he knows to lift her chin when administering breaths! Snow enters the scene and finds a young woman on the ground unconscious with a hole in her leg. Through an earpiece, an agent guides him through how to assist the woman. He instructs Snow to open the ‘medi-pack’ and get the ‘defib-kit.’ With only 15 seconds, he has to gel the two small pads, place them on her chest and make sure they stick. Then, using the AED, he administers a shock using a small box. The agent tells Snow that he was able to get a pulse but he now needs to give an injection of serotonin and norepinephrine. The problem is that he needs to inject it through the center of her right eye into her brain. After doing this with much hesitation, and another shock to the heart, the young woman begins to seize. Once she stops seizing, the agent rushes Snow, telling him to give her mouth to mouth. He gives the woman two breaths before she wakes up, pushing Snow off of her in disgust. Although the film is set in the future, it can still be understood that this AED is much different than ones we use today. This defibrillator has no pad storage option, no buttons (except a small moveable button on the side), and no voice activated instructions. If it were not for the agent in his earpiece, Snow would not have known what to do to revive the woman. And as much as we’d like to think it all worked that fast, that shock was in record time. If you watch carefully in the video, Snow places the two pads on her chest, one near her armpit and the other closer to her collar bone. This placement is not going to be effective as the shocks are not properly reaching her heart. Instead, the pads should be placed 1) just on the right side of the chest and 2) on the left side of the body over the ribs. This placement is necessary for the shock to make its way through heart. Again, the body does not shoot off the ground like that after a sock. With all of these errors in movies it would seem that using an AED is difficult. But it isn’t! These films use strange, and often unrealistic AEDs that would not actually work. Using an AED is easy, and with the help of images, labeled buttons, and voice activated instructions, anyone can assist a person experiencing a cardiac arrest.